For the last week, I’ve been brainstorming a way to make a caramel apple pie. In theory, it sounds delicious. But Nate and I both agreed that in practice it might not work the way we envision it. I can’t put my finger on it. Maybe it would work and I’m just over thinking it! 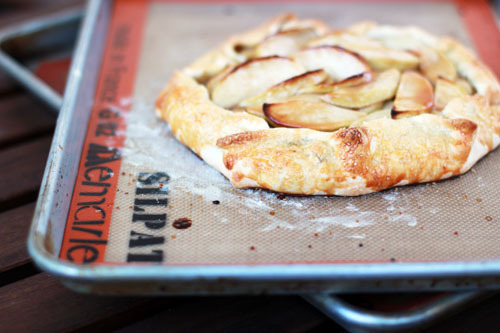 Regardless, all this caramel apple pie thinking inspired what I actually ended up making…a caramel apple galette! For some reason, in my brain the caramel just seemed to work better with a galette than in a pie. Yesterday I made this caramel apple galette and it came out great! Super yummy and I loved the caramel flavor paired with the apples (I know, big surprise). I also sprinkled a bit of coarse salt on top at the end. Salted caramel is always welcome in my world! I didn’t add the caramel until right after the galette came out of the oven. I wanted the caramel to be smooth and gooey, not burned or caramelized. This technique worked perfectly. I combined a few recipes and also simplified things by using a store-bought crust. Feel free to use your favorite homemade crust recipe if you like. For Thanksgiving cooking, I like to simplify wherever I can. In this case, a store-bought crust did the trick and tasted wonderful! Place sliced apples in a large bowl. Toss with lemon juice. Add ⅓ cup granulated sugar, the cinnamon and salt and stir well. 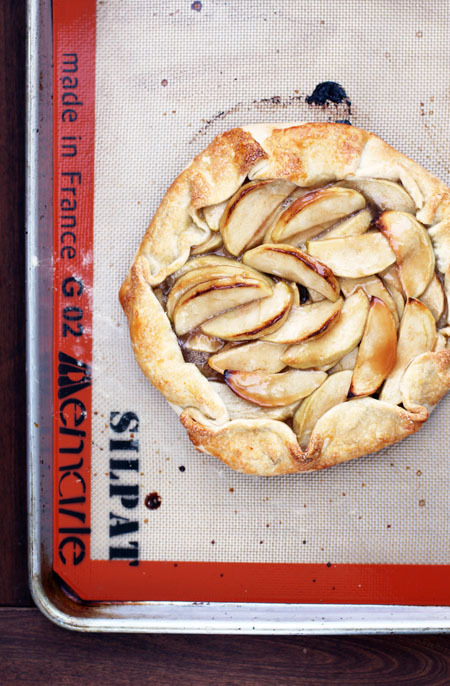 Lay rolled out 9-inch pie crust on cookie sheet lined with a silpat or parchment paper. Make sure there aren’t any holes in the pie crust! Pile the applies in the middle, leaving about a 3 inches of crust around the edge. Fold edges of the dough up around the apples. Make sure not to break any holes in the dough and also make sure the dough wraps up and over the apples so there isn’t any leakage. Pour most of the sugary-lemon juice leftover in the apple bowl over the apples. Brush outside of crust edges with egg then sprinkle with coarse turbinado sugar. I sprinkled a bit of that sugar over the apples as well! Bake for about 40 minutes, until crust is dark brown. 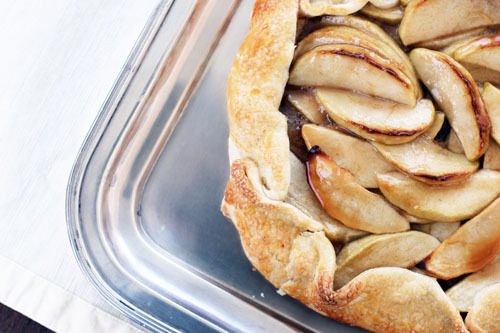 Remove from the oven and immediately pour caramel sauce (see directions below) over the apples, making sure to not spill over the edge of the galette. I poured most of the caramel from this recipe over the galette, with about ¼ cup or so left over. 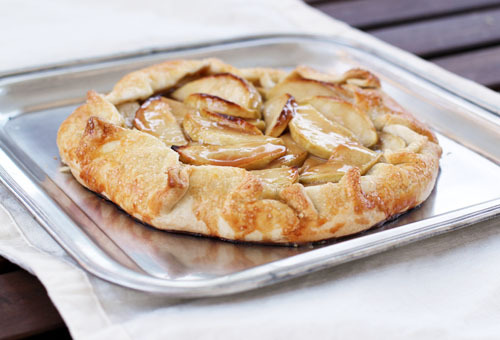 If desired, sprinkle galette with a bit of coarse salt. 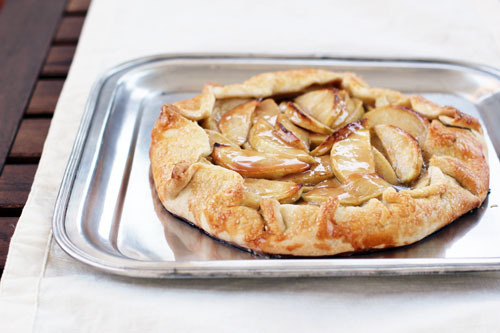 While galette is baking, combine the sugar and water in a small saucepan. Do not stir. Cook over medium-high heat until it starts to brown, swirling as it begins to brown to distribute the sugar. While the sugar and water are going at it, heat up the cream in a saucepan or microwave just until warm. Once sugar water is light brown, remove from the heat and add your room temperature butter. Whisk the butter in, being sure it’s totally combined. Add the warmed cream and whisk vigorously. (Watch out for steam when adding the butter and especially the cream.) Let sit until galette is done. Caramel should be pourable consistency. If you want to transfer the galette to a serving platter, as I’m sure you will, it is a 2 person, 3-4 spatula job. Four-year old Anna was my assistant with moving the galette and she did beautifully!